Becoming an NBA dynasty, Golden State made it three titles in four years, and collectors can make the full team set with one box of 2018 Panini Golden State Warriors NBA Champions. Joining a whole selection of Warriors NBA Champions gear, the official factory sets are priced at $29.99 from Fanatics. Paying tribute to the 2017-18 NBA title winners, 2018 Panini Golden State Warriors NBA Champions offers 30 cards in total. Every box contains 15 player cards with images of each subject holding the Larry O'Brien Trophy. There are also eight cards showcasing highlights from the NBA Finals, 3 celebration image cards, and one card each for the head coach, team image and team logo. It appears that Panini is also selling a very similar, if not identical set, through their Instant platform. However, these offer a separate (and more expensive) Green (#/10) and Black (1/1) version along with the red base set. Also, the limited-edition cards apparently don't come in the commemorative box. 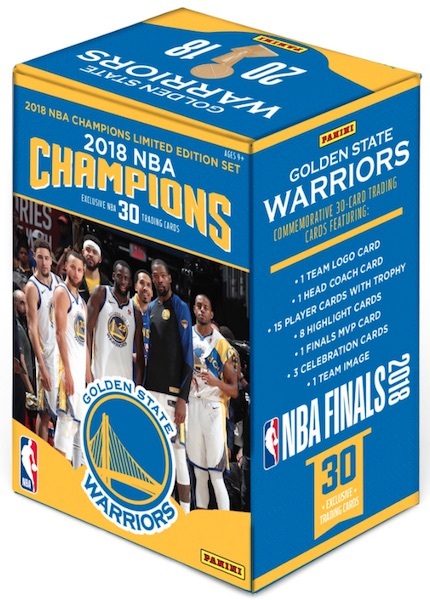 Order 2018 Panini Warriors NBA Champions boxes at Fanatics. If you can wait till Christmas, these will be $9.99.